Gwyneth Paltrow, Best Actress Oscar winner for Shakespeare in Love, and Academy Award nominee Robert Downey Jr arrive at the world premiere of Jon Favreau's Iron Man 2, held on April 26, 2010, at the El Capitan Theatre in the heart of Hollywood. Now that the whole world knows about his dual-identity secret, billionaire inventor Tony Stark (Downey Jr.) faces pressure from the US government, the media, and the public at large to share his technology with the American military in Iron Man 2. Stark, however, is not willing to let such potentially destructive technology fall in the wrong hands. And there are lots of wrong hands out there, both within the military and elsewhere. As a result, the inventor relies on the assistance of Pepper Potts (Paltrow) and James “Rhodey” Rhodes (Don Cheadle) to protect himself and his iron suit, while attempting to make new friends along the way. All the while, he also has to face some incredibly powerful enemies. Iron Man 2 has been one of the most eagerly awaited movies of the season, but thus far reviews have not been exactly positive. Directed by Favreau from a screenplay by Justin Theroux, in addition to Downey Jr, Cheadle, and Paltrow, Iron Man 2 stars Scarlett Johansson, Sam Rockwell, Mickey Rourke,Kate Mara, Samuel L. Jackson, Garry Shandling, and Paul Bettany. Scarlett Johansson, the star of Woody Allen's Match Point, and Pulp Fiction's Samuel L. Jackson arrive at the world premiere of Jon Favreau's Iron Man 2, starring Robert Downey Jr in the title role, held on April 26, 2010, at the El Capitan Theatre in the heart of Hollywood. 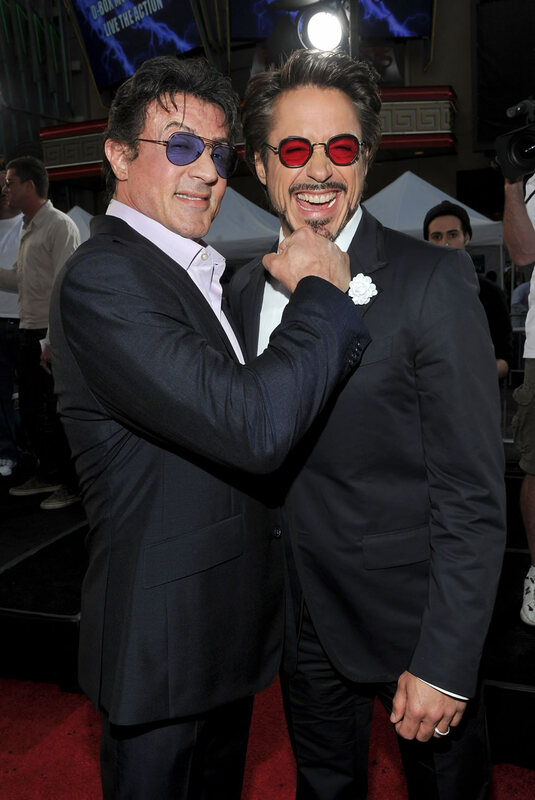 Veteran Sylvester Stallone, best known for his Rocky and Rambo movies, and Academy Award nominee Robert Downey Jr arrive at the world premiere of Jon Favreau's Iron Man 2, held on April 26, 2010, at the El Capitan Theatre in Hollywood.